Our small friendly restaurant in Farndon with garden area serving good value homemade food is open Wednesday - Friday for Lunch and Wednesday to Saturday for Dinner. We take bookings so please give us a call on 01829 270556 or you can email us & we will contact you. On Sundays, Mondays and Tuesdays the restaurant is available for private hire for special occasions and birthday parties. James Churton and Suzanne Little. 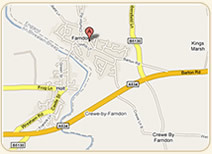 Visiting Farndon to shop, walk along the river? Come and see us! Having a party - let us do the work! 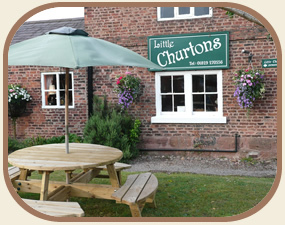 Our restaurant Little Churtons is in the Cheshire village of Farndon which lies on the River Dee close to Chester and across the bridge from Holt in North Wales. We have a garden & some tables outside. © 2009 - 2019 Little Churtons. All rights reserved.